Google today announced it is kicking off a new Google Maps pilot program that lets third-party organizations borrow the Street View Trekker and contribute imagery back to the service. In other words, groups outside of Google will soon be able to use the company’s camera equipment to collect 360-degree photos and help capture the world around them. Google has a lot to gain: the end result is a more comprehensive and useful Google Maps service for all involved. “This program is part of our ongoing effort to make it possible for anyone to contribute to Google Maps,” the company says. For those who don’t know, the Street View Trekker is a wearable backpack outfitted with an Android device and a 15-lens camera system on top. It’s portable, letting the user gather images while maneuvering through tight and narrow spaces, and especially locations only accessible by foot. Each lens is angled in a different direction so the images can be stitched together into 360-degree panoramic views. As you walk with it, photos are taken roughly every 2.5 seconds. 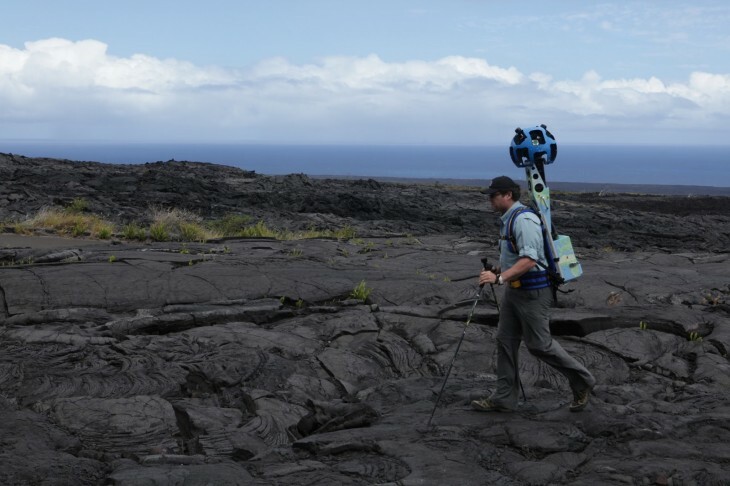 Google already has a first partner, the Hawaii Visitors and Convention Bureau (HVCB), which has begun using the Trekker. HVCB has been taking photos of the Hawaiian islands for future inclusion in Google Maps. Google’s own team went to Hawaii a few days ago to train HVCB in operating the Trekker technology. We can thus presume that the company will do the same for future partners; there’s no sense in giving others equipment they don’t know how to use. If you’re a tourism board, non-profit, government agency, university, research organization or other entity interested in borrowing a Street View Trekker to capture and share imagery from a place you know and care about, please apply today. In the coming months, we’ll open up this pilot program to a limited number of other organizations around the world. If you fit this criteria, go ahead and fill out this form.